A common temptation – one you should strongly avoid – is to try to answer all of these questions by means of a single, heavily overloaded, all-encompassing model. This sort of model (and we’ve all seen them) will probably use a mixture of formal and informal notations to describe a number of aspects of the system on one huge sheet of paper: the functional structure, software layering, concurrency, intercomponent communication, physical deployment environment, and so on. However this sort of AD is really the worst of all worlds. Many writers on software architecture have pointed out that it simply isn’t possible to describe a software architecture by using a single model. Such a model is hard to understand and is unlikely to clearly identify the architecture’s most important features. It tends to poorly serve individual stakeholders because they struggle to understand the aspects that interest them. Worst of all, because of its complexity, a monolithic AD is often incomplete, incorrect, or out-of-date. Principle: It is not possible to capture the functional features and quality properties of a complex system in a single comprehensible model that is understandable by and of value to all stakeholders. We need to represent complex systems in a way that is manageable and comprehensible by a range of business and technical stakeholders. A widely used approach-the only successful one we have found-is to attack the problem from different directions simultaneously. In this approach, the AD is partitioned into a number of separate but interrelated views, each of which describes a separate aspect of the architecture. Collectively, the views describe the whole system. Definition: A view is a representation of one or more structural aspects of an architecture that illustrates how the architecture addresses one or more concerns held by one or more of its stakeholders. It would be hard work if every time you were creating a view of your architecture you had to go back to first principles to define what should go into it. Fortunately, you don’t quite have to do that. In his introductory paper, Kruchten defined four standard views, namely, Logical, Process, Physical, and Development. The IEEE standard makes this idea generic (and does not specify one set of views or another) by proposing the concept of a viewpoint. 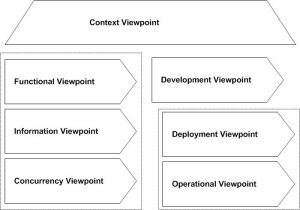 The objective of the viewpoint concept is an ambitious one – no less than making available a library of templates and patterns that can be used off the shelf to guide the creation of an architectural view that can be inserted into an AD. We define a viewpoint (again after IEEE Standard 1471) as follows. Definition: A viewpoint is a collection of patterns, templates, and conventions for constructing one type of view. It defines the stakeholders whose concerns are reflected in the viewpoint and the guidelines, principles, and template models for constructing its views. 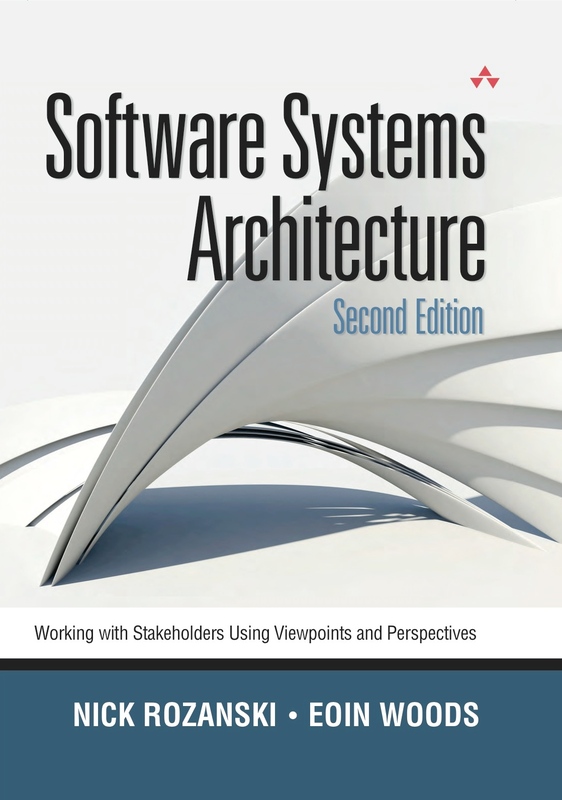 Part III of our book presents our catalog of six core viewpoints for information systems architecture: the Functional, Information, Concurrency, Development, Deployment, and Operational viewpoints. Click on a viewpoint name for a definition of that viewpoint. Context Describes the relationships, dependencies, and interactions between the system and its environment (the people, systems, and external entities with which it interacts). Many architecture descriptions focus on views that model the system’s internal structures, data elements, interactions, and operation. Architects tend to assume that the “outward-facing” information — the system’s runtime context, its scope and requirements, and so forth – is clearly and unambiguously defined elsewhere. However, you often need to include a definition of the system’s context as part of your architectural description. Functional Describes the system’s functional elements, their responsibilities, interfaces, and primary interactions. A Functional view is the cornerstone of most ADs and is often the first part of the description that stakeholders try to read. It drives the shape of other system structures such as the information structure, concurrency structure, deployment structure, and so on. It also has a significant impact on the system’s quality properties such as its ability to change, its ability to be secured, and its runtime performance. Information Describes the way that the architecture stores, manipulates, manages, and distributes information. The ultimate purpose of virtually any computer system is to manipulate information in some form, and this viewpoint develops a complete but high-level view of static data structure and information flow. The objective of this analysis is to answer the big questions around content, structure, ownership, latency, references, and data migration. Concurrency Describes the concurrency structure of the system and maps functional elements to concurrency units to clearly identify the parts of the system that can execute concurrently and how this is coordinated and controlled. This entails the creation of models that show the process and thread structures that the system will use and the interprocess communication mechanisms used to coordinate their operation. Development Describes the architecture that supports the software development process. Development views communicate the aspects of the architecture of interest to those stakeholders involved in building, testing, maintaining, and enhancing the system. Deployment Describes the environment into which the system will be deployed, including capturing the dependencies the system has on its runtime environment. This view captures the hardware environment that your system needs (primarily the processing nodes, network interconnections, and disk storage facilities required), the technical environment requirements for each element, and the mapping of the software elements to the runtime environment that will execute them. Operational Describes how the system will be operated, administered, and supported when it is running in its production environment. For all but the simplest systems, installing, managing, and operating the system is a significant task that must be considered and planned at design time. The aim of the Operational viewpoint is to identify system-wide strategies for addressing the operational concerns of the system’s stakeholders and to identify solutions that address these.